Nisga'a Nation Executive Chairperson Brian Tait was a guest speaker at a forum discussing the reality of Aboriginals doing business on Thursday November 1st. Hosted on the traditional territory of the Kitsum Kalum and Kitselas First Nations, the Nation 2 Nation Forum took place November 1st and 2nd at the Terrace Sportsplex. Chairperson Tait's guest speaking engagement entitled, 'Open for Business: An Economic Update from Nisga'a Lisims Government' provided the audience an overview of the Nisga'a Nation's track record working with industry and our endeavours going forward. The two day forum wraps up today with keynote and panel presentations from Maynard Angus of the Prince Rupert Port Authority, City of Prince Rupert Councillor (and Gitmaxmak'ay CEO) Blair Mirau, MP Nathan Cullen and much more! 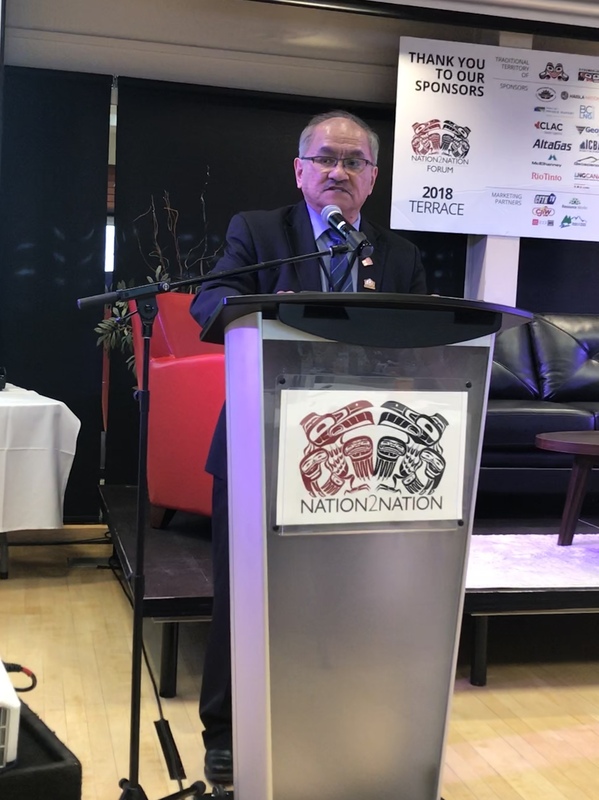 The Nation 2 Nation Forum was created by Lisa Muelller to bring together First Nations, Government and Industry in the northwest.